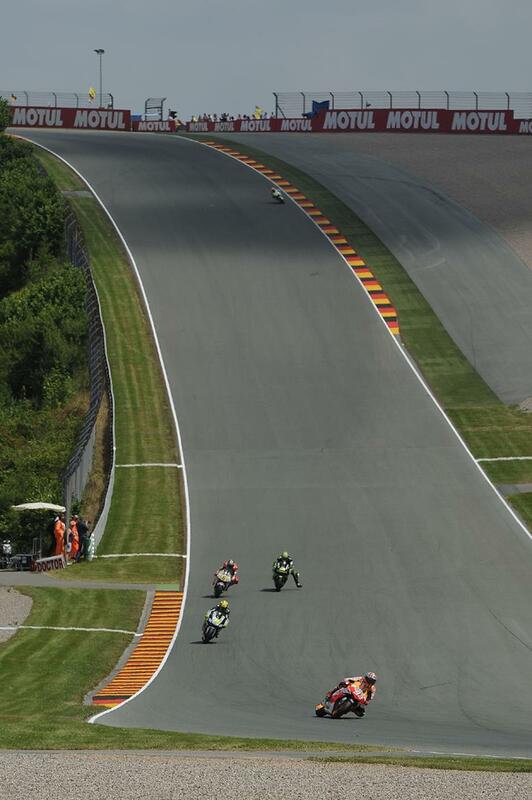 A select group of top MotoGP riders will take part in a special pre-race test in the Sachsenring next month to assess whether the German venue’s jaw-dropping Turn 11 needs modifying for 2015. The downhill plunge, nicknamed the ‘Waterfall’ has been the scene of several big crashes, and it was initially thought the corner could be altered ahead of this year’s clash on July 13. MotoGP Safety Officer Loris Capirossi took part in a special test back in March where he rode a BMW S1000RR around artificial kerbing to understand if a re-profiling of Turns 10 and 11 would make the section safer. But with no time implement any proposed modifications for this season, it has been decided that a rider representing each manufacturer will lap the Sachsenring on the Thursday before the race to evaluate potential changes for next year. Race Director Mike Webb told MCN: “There wasn’t enough time to get it modified and to be sure that the modification were better and not worse. Loris and Franco Uncini came up with what they thought was a reasonable solution and we all agree in the Safety Commission that on paper it looks fine. But a final decision will be taken the day before practice this year.